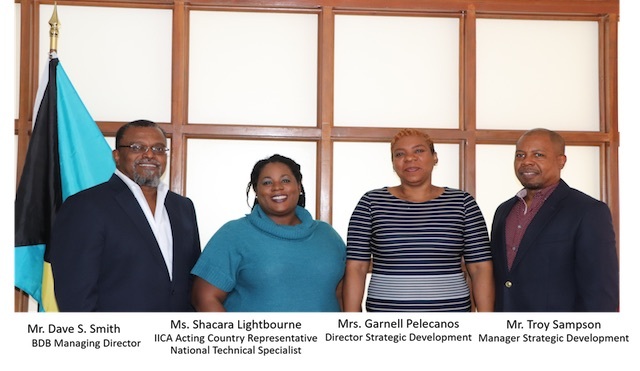 In continuation of fulfilling its mandate under the Bahamas Development Bank Act, 1974, to promote industrial, agricultural and commercial development through financing and investing in approved enterprises, BDB hosted a courtesy call from the country representative of the InterAmerican Institute for Cooperation on Agriculture (IICA), Ms. Shacara Lightbourne. The Inter-American Institute for Cooperation on Agriculture is comprised of thirty-five hemispheric nations. The purpose of the institute is to encourage, promote, and support the efforts of Member States to achieve their agricultural development, generating opportunities to reduce hunger and improve economic development throughout the hemisphere. With this in view, BDB’s collaborative relationships with IICA and the Ministry of Agriculture and Marine Resources is important in advancing development of the agriculture sector. Matters of mutual interest discussed were: IICA’s strategic plan for The Bahamas, ongoing technical support of various BDB initiatives, such as the Grand Bahama Youth Apiculture Development Program in Grand Bahama, industrialization of Cascarilla in Acklins and Crooked Island along with opportunities for small ruminant farming throughout the archipelago. Mr. Dave Smith, Managing Director of the Bahamas Development Bank emphasized the timeliness of the IICA meeting as BDB ramps up its efforts to facilitate economic activity including a focus on Small & Medium Enterprises. Mr. Dave Smith, in his speech at the recently held Bahamas Business Outlook indicated, “Notwithstanding the fact that BDB has enjoyed 40 years of assisting Bahamians, there is a keen awareness that collaboration with partners and stakeholders, consistency in effort as it regards to service and communication to raise awareness of access and opportunity are important axioms for success as BDB continues to be a catalyst for economic development”. Mr. Smith also stated that BDB values IICA as a strategic partner given their technical knowledge and wide network of resources.